Streets of Washington, written by John DeFerrari, covers some of DC’s most interesting buildings and history. John is the author of Historic Restaurants of Washington, D.C.: Capital Eats, to be published this September by the History Press, Inc. John is also the author of Lost Washington DC. 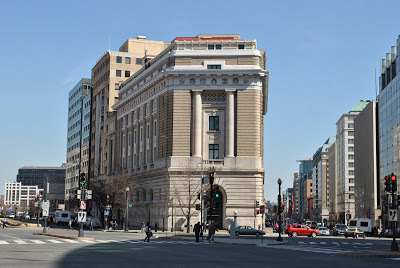 One of the stateliest private buildings in Washington is the old Masonic Temple at 13th Street and New York Avenue NW, completed in 1908 and now home to the National Museum of Women in the Arts. Like other Masonic temples, the imposing structure was built with unique cross purposes; it was meant to be both a public forum for lectures and performances as well as a private place for the fraternal order’s meetings and rituals. Since the 1980s, this distinctive Renaissance Revival palace has had a remarkably fitting second life as a museum, and now the NMWA is looking to preserve the building for many more years with much-needed roof repairs. As a participant in the Partners in Preservation program, the museum will be hosting a festive open house this Sunday, May 5, from 12 to 5, offering a great, free opportunity to see this extraordinary building up close and appreciate the art it now displays. The sharp-eyed visitor will notice decorative touches denoting the building’s original use as a Masonic Temple. Freemasonry is a centuries-old tradition descended from medieval stone masons’ guilds, although modern masons are a strictly fraternal order dedicated to benevolent acts. Masons organize themselves into lodges, which are chartered by regional Grand Lodges. DC got its own Grand Lodge in the mid 19th century. In 1870 it built a temple, still standing, at 9th and F Streets NW, but by the 1890s, with 49 Masonic lodges chartered throughout the city, the old hall was no longer adequate. The Masons resolved to build a magnificent new temple at a suitably prestigious location. The site selection committee received some 20 offers for sites all around the city, and in 1899 they chose the distinctive trapezoidal corner lot formed by New York Avenue, 13th Street, and H Street NW, a prominent location that would allow unobstructed vistas of the new temple on three sides. The lot, once a knoll with a clump of trees known as “Seven Oaks,” cost $115,000. Next, six of the city’s best architectural firms were invited to submit competing designs for the new building. The winner was the firm of Wood, Donn, and Deming, whose most famous partner was Waddy B. Wood (1869-1944), who would later go on to design buildings ranging from the headquarters of the Interior Department to distinguished houses in the Dupont Circle and Kalorama neighborhoods. 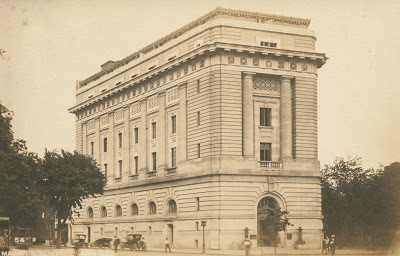 For the Masonic Temple, Wood, Donn, and Deming chose a classical Renaissance Revival style that reflected the prevailing architectural preferences of the day. The heavily rusticated design—especially seen in the first floor elevation—conveyed institutional permanence and dignity but also served as a bravura display of the stonemason’s craft. 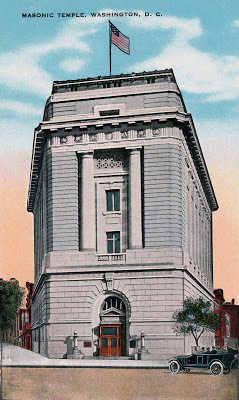 The Masonic Temple c. 1920 (Author’s collection). True to classical tenets, the building displays pronounced differences between top, middle and bottom. Above the exquisitely-cut Indiana limestone first level—some 30 feet tall—the central section is brick with terra cotta and limestone trim and includes temple-like classical columns and pilasters. To modern eyes, it looks as if floors were added to the building at some point after it was completed; a couple of extra stories rise above the impressive limestone cornice that rings the building at the fifth floor. However this was part of the original design and appears to emphasize how the top floors of the structure, where the Mystic Shrine was located, were elevated above the lower spaces given over to the hoi polloi. Postcard view of the 13th Street façade (Author’s collection). The interior design mirrored the exterior layout. Nearly the entire first floor was filled by a grand auditorium, which fit neatly into the building’s trapezoidal space. The stage was set against the narrow 13th Street side, and seating for 1,800 people fanned out in front of it and in balconies ringing the opposite walls. Designed as a music hall, a grand organ was included as well as space for a dance floor. It was expected that suppers could be served in the large basement banquet hall directly underneath the auditorium. 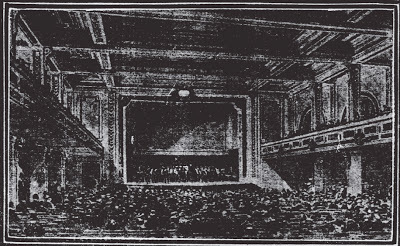 Drawing of the planned first-floor auditorium from The Washington Times, Oct. 10, 1905. The middle floors were devoted to office, library, and commercial space, while the fifth and sixth floors—the exclusive upper levels—held another, somewhat smaller auditorium for use by the Masons’ Scottish Rite and Mystic Shrine. “The stage is to be so arranged that the most elaborate services of the Scottish Rite can be given in their entirety,” claimed the Washington Times in 1905—without explaining what exactly that meant. The former auditorium space as it appears today (photo by the author). It took longer to design the building than to construct it. Wood, Dunn, and Deming got the job in 1903, but construction didn’t begin until 1907. The cornerstone-laying ceremony, attended by President Roosevelt, was held June 8, 1907, and by October 1908 the Masons began a two-week-long celebration to open the new building, featuring opera singer Lillian Nordica (1857-1914) as well as the sensational young violinist Albert Spalding (1888-1953) in the grand auditorium. There were also many lectures, mostly on travel. L. Frank Baum (1856-1919), author of The Wizard of Oz, was another draw. From the start, the first-floor auditorium was intended to be rented out as a source of income to the temple, and a wide variety of entertainment appeared there in the early days. In December 1908, just two months after the building opened, the auditorium featured a limited run of “Bradley’s Novelty Pictures,” a collection of early motion picture shorts. “Those who have seen them declare that no more artistic motion pictures are to be found in the American amusement world. They are educational and entertaining, and the coloring is done entirely by hand,” the Washington Post observed. Postcard of the Army and Navy center (Author’s collection). In addition to movies and other entertainment in the auditorium, various shops and offices rented space on the second floor of the building, including a dentist, insurance agent, and uniform supply company. 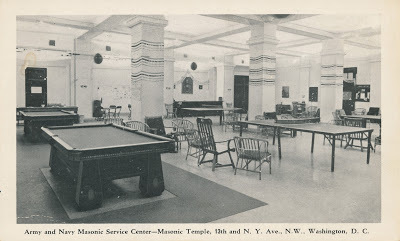 The basement banquet hall became the Army and Navy Masonic Service Center, a USO-style lounge for servicemen. In 1941, the first-floor auditorium was thoroughly renovated and reopened as the Pix Theatre, a first-run commercial movie theater. After the war the Pix, like many of the second tier of downtown’s movie houses, started featuring risqué material, and in the early 1950s it moved to 9th Street, where the city’s burlesque houses congregated. At the Masonic auditorium, the Pix was replaced by the Art Cinema, which stretched the meaning of the term “art.” An advertisement from 1955 featured a double billing of “Kerima The She-Wolf” (The Most Evil Woman Who Ever Lived!) and “Formosa” (The Hot Bed of the Far East!). The Town Theatre circa 1983 (courtesy of NMWA). The Masons were not happy with the direction the theater was going in, and the Art Cinema’s lease was not renewed. 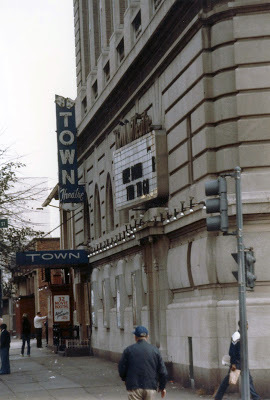 In 1959 new management remodeled the space and opened the Town Theatre, a first-run venue complete with white-gloved ushers. Premieres at the Town included “Psycho,” “To Kill a Mockingbird,” and “La Dolce Vita.” But the theater was living on borrowed time, as downtown was already declining when it opened, and the immediate neighborhood grew increasingly desolate. Though it never stooped to the skin trade as many nearby shops did, the Town’s offerings shifted in the 1970s to kung fu and other action films, much as had happened at its venerable neighbor, the Keith. 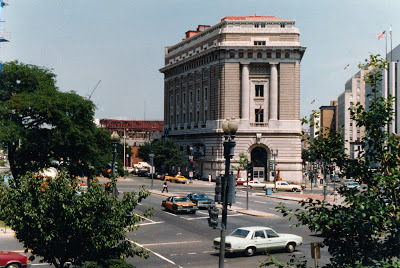 The Masonic Temple, circa 1983 (courtesy of NMWA). By the early 1980s, the Masons were ready to abandon their once prestigious temple. When they put the building on the market in early 1983, preservationists hurried to have the structure designated as an historic landmark to prevent developers from tearing it down, but their worst fears never came to pass. Later that year, the fledgling National Museum of Women in the Arts, an organization founded by art collector and philanthropist Wilhelmina Holladay, purchased the structure. The beautiful but highly unusual building had found a perfect new owner. The NMWA undertook an $8 million effort to renovate the old temple and convert it into a museum. With the building’s exterior protected from alterations, the architectural firm of Keyes Condon Florance focused on sympathetic alterations and restorations of the interior spaces, breathing new life into them. The grand first-floor auditorium was converted into special event space. 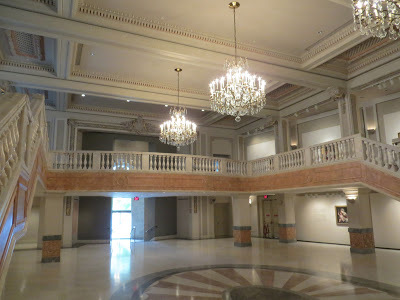 The balconies were reconfigured and connected across the front of the room’s old stage to form a mezzanine overlooking the elegant, newly-marbled main floor. With minor adjustments, the fifth floor auditorium was restored for use as the museum’s auditorium, while other spaces became galleries and offices. Nancy Reagan cut the ribbon at the grand opening of the new museum in April 1987. 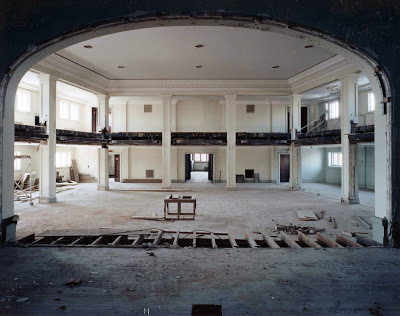 The fifth floor auditorium, viewed from the stage, before restoration (courtesy of NMWA). 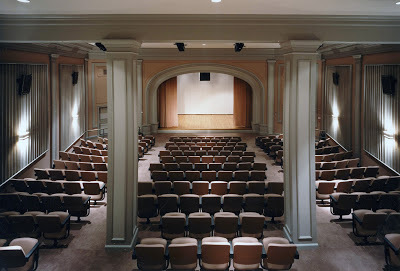 The fifth floor auditorium, viewed from the rear, after restoration (courtesy of NMWA). 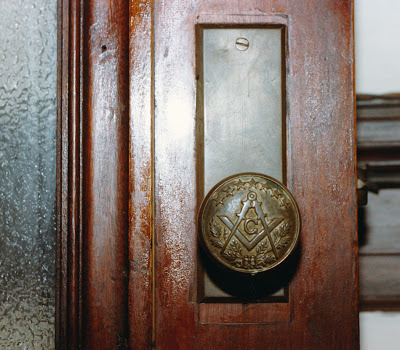 An original doorknob, circa 1984 (courtesy of NMWA). The NMWA remains today the only museum solely dedicated to celebrating the achievements of women in the visual, performing and literary arts. The museum’s aim is to honor women artists of the past, promote the accomplishments of women artists of the present, and assure the place of women artists in the future. 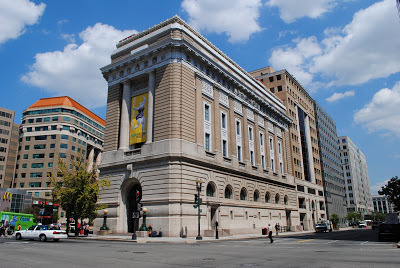 As a participant in the Partners in Preservation program, which will distribute $1 million for historic preservation projects throughout the Washington, D.C. area, the NMWA seeks help in funding much-needed repairs to the building’s unique roof and complex drainage system. By voting for NMWA at the Partners in Preservation website, you can help it try to win a larger share of the funds. The site with the most votes will have its proposed project fully funded, although the other participants will receive a share of funding as well. The NMWA today (photo by the author). This coming Sunday, May 5, the NMWA will host a festive open house, with free admission to the museum and live entertainment from noon to 5pm. Youth and adult musicians affiliated with GirlsRock!DC will showcase their talents during a series of performances, helping visitors discover their inner rock star on guitar, keyboards and drums during instrument shares throughout the afternoon. It’s also a chance to view intriguing exhibits dedicated to Impressionist-like Danish modern painter Anna Ancher (1859–1935) and Washington, D.C.-based artist Freya Grand. Special thanks to Gordon Umbarger and Amy Mannarino of the National Museum of Women in the Arts for much helpful information and the use of historic images. Thanks also to Elyssa Rae who is helping to coordinate the Partners in Preservation program. Additional information came from historic newspapers and magazines as well as the building’s National Register of Historic Places nomination.